As smartphones have become more and more accessible, China has seen a vibrant mobile app scene, ranging from gaming and shopping to dating. In the third quarter of 2017, smartphone users in China downloaded 34 apps on average and used the apps for an average 3.7 hours per day, according to a report from the Chinese mobile data research firm Jiguang. Jiguang recently put together a data report on the overall ranking of the mobile apps across verticals in the third quarter of 2017. Here are some of the highlights. 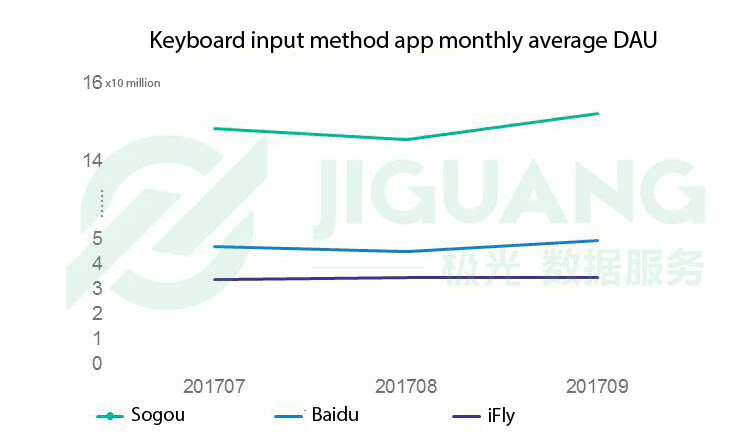 Sogou (搜狗) dominated the keyboard input method vertical with a high penetration rate at 41.2% in September, boasting 150 million daily active users (DAU). Baidu came in second with a 25.7% penetration rate, and saw 49 million daily active users. The third largest player went to iFly (讯飞) with its penetration rate at 13.6%. It has 34 million daily active users. The e-commerce sector remains a very hot and very competitive vertical. Taobao (mobile), unsurprisingly, topped the list with the penetration rate at 51.3%, while JD (mobile) followed behind with an 18.4% penetration rate. However, it’s worth noting that JD saw a higher quarter-on-quarter growth rate than Taobao, where the former secured a 5.1% growth rate and the latter saw 1.0% growth. Following closely with JD, VIP (唯品会, formerly known as Vipshop.com) came in third with the penetration rate at 15%. With “New Retail” strategy becoming a buzzword in the retail sector, more and more retailers are looking to online-to-offline development–delivery fresh produce to consumers’ homes. Among the players, JD topped the chart with its Daojiao app with the penetration rate at 0.29%. Closely following JD was the Tencent-backed Miss Fresh (每日优鲜) with its penetration rate at 0.26%. It’s important to underline the fact the Miss Fresh’s business has been burgeoning and has seen a 33.9% quarter-on-quarter growth. Initially starting out with offline fresh produce sales, Pagoda (百果园) came in third with a 0.09% penetration rate. Didi Chuxing, China’s leading car-hailing service, remains the largest player with an 11.3% penetration rate. UCAR (神州专车) came in second with the penetration rate at 1.16%. 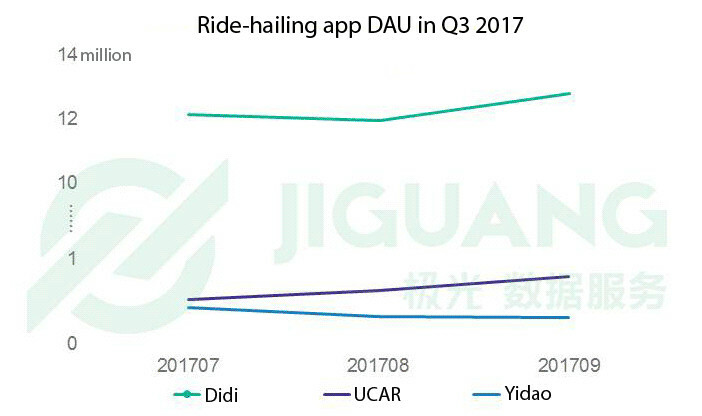 UCAR may appear to fall a lot behind Didi; however, it’s important to underline the fact that UCAR saw a 44.4% quarter-on-quarter growth, reflecting that the UCAR is a player which we shouldn’t overlook. It didn’t come as a surprise that the top two players in the bike-rental vertical are Mobike and ofo. As more players have either gone out of business in the bike-rental sector in the third quarter this year or were revealed to have issues with deposit withdrawals, it’s clear that Mobike and ofo have both secured stable spots in the industry. Mobike held a 5.6% penetration rate, and ofo saw its penetration rate at 5.2%. In terms of DAU, Mobike surpassed ofo and had 5 million daily active users in September. Honors of King saw the most traffic among apps in the gaming sector, with its penetration rate at 23.9%. Its DAU number, however, has slightly declined from 7.1 million in July to 6.8 million in September. Kaixin Xiaoxiaole (开心消消乐) came in second with a 12.7% penetration rate, and Fight the Landlord (欢乐斗地主) secured the third place with the penetration rate at 8.7%.